People often overestimate how much disk space they need when backing up computers, especially when multiple computers are involved. It is reasonable, of course, to assume that to determine backup capacity that you would simply add up how much data is (or the hard drive/SSD capacity is) on each computer you’re backing up. In reality, you probably need much less space than you might assume. Backup and disaster recovery products such as the DataHarbor Network Backup Appliance are designed to deduplicate (“dedupe”) and compress data that it is backing up from laptops and computers. As a result, taking advantage of these capabilities greatly reduces the amount of backup storage or backup disk space required to safely back up an office full of computers. Deduplication is a technique in which the backup device saves only one copy of programs and files common to more than one workstation. For example, it’s quite common for most, if not all, computers in an office to be running the same version of an operating system. Or perhaps, everyone has the same applications installed on their systems. Several people might have saved copies of the same spreadsheet or other files to their hard drives. The backup device takes note of this and only keeps one copy of the duplicated software and data. If a workstation needs to be restored, the device is able to orchestrate the restoration of all of the applications and data needed to rebuild the workstation to its previous state. Both of these techniques greatly reduce the amount of disk space needed as well as the amount of time needed to back up an office’s computers. The charts shown below nicely demonstrate the value of deduplication and compression to reduce the amount of storage needed for backing up two different small businesses. 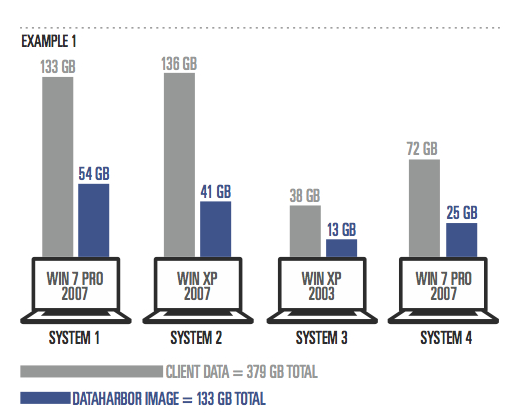 In the first instance, the amount of storage needed on the DataHarbor appliance is 35% of the aggregate storage space on the computers being backed up. So before you end up overspending and overprovisioning your backup storage requirements, think about what data you really need to back up, as well as how likely it is that you can greatly reduce the amount of backup space needed. If you need help, let us know.